Camille A. Nelson's appointment as the new dean of the American University Washington College of Law begins July 25, 2016. 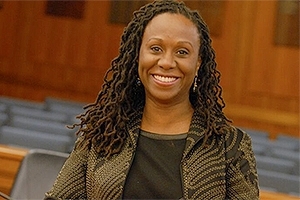 After an extensive national search, the American University Washington College of Law has appointed Camille A. Nelson as the school’s next dean. Nelson’s appointment begins July 25, 2016. A widely published scholar and sought-after speaker, Nelson is an expert on the intersection of critical race theory and cultural studies with particular emphasis on criminal law and procedure, health law, and comparative law. Read the Diverse Issues in Higher Education feature about Nelson. The Washington College of Law, which recently celebrated the 120th anniversary of its founding, is home to nationally recognized programs in Clinical Legal Education, International law, Trial Advocacy, and Intellectual Property. With 20,000 alumni, including more than 4,000 in countries around the world, the law school’s impact is wide reaching, providing numerous opportunities for students and graduates. Nelson comes to WCL just after its move to a new, state-of-the-art facility on American University’s Tenley Campus which opened for classes in January and held an official ribbon cutting February 12. Nelson recently served a 5-year term (2010–2015) as dean of Suffolk University Law School in Boston, where she is currently a professor of law. During her tenure as dean at Suffolk, she led the creation of the school’s first strategic plan and achieved considerable successes in fundraising, grant writing, and program and partnership development. An innovator in legal education, Nelson is committed to preparing graduates for success in an evolving legal marketplace. Nelson established Suffolk’s Institute on Law Practice Technology and Innovation and also instituted the nation’s first program concentration in legal technology and innovation. Under her leadership, Suffolk University Law School also launched a ground-breaking “Accelerator to Practice” program—a comprehensive, three-year program that prepares graduates to upstart or join law practices whose clients are average-income individuals and families. While at Suffolk, Nelson increased student, faculty, and administrator diversity and implemented a diversity pipeline program to encourage undergraduate students from underrepresented groups to pursue law degrees. Her ability to inspire and innovate at Suffolk also facilitated the Women's Leadership Academy, a Caribbean and Latin America Initiative, and a Five Point Bar Success Program. Prior to her career at Suffolk, Nelson served on the faculty of the Saint Louis University School of Law for almost 10 years, during which she was named the school’s 2004 Faculty Member of the Year and received the 2006 University Faculty Excellence Award. She also held appointments at Hofstra University Law School, Washington University in Saint Louis School of Law, University of Ottawa Faculty of Law, University of Hawaii, Université de Paris-Dauphine (France), and Columbia Law School. Before entering academia, Nelson clerked for Justice Frank Iacobucci of the Supreme Court of Canada and worked as a litigation associate at one of the largest law firms in Canada. Nelson’s other contributions to the advancement of legal education and the legal profession are extensive. She serves on the Association of American Law Schools Nominating Committee and is an elected member of the American Law Institute. Most recently, she served on the Senator Warren and Senator Markey Advisory Committee on Massachusetts Judicial Nominations; the Steering Committee of the American Association of Law Schools Deans Forum; as co-chair of the Association of American Law Schools Section for the Law School Dean, and on the Boston Bar Association Board. Massachusetts Lawyers Weekly recognized her as a “Top Woman of Law” and she was named to the Power 100: Most Influential Black Lawyers in the US.